We serve & protect the most vulnerable among our nation's veterans. In partnership with our members across the nation we are ending veteran homelessness by connecting vets to housing, jobs, health care, benefits, food, transportation & legal aid. 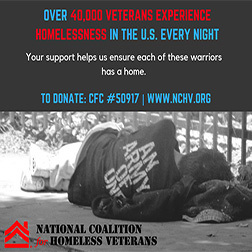 Nearly 200,000 veterans are homeless on any given night. Veterans become homeless because of health problems (post traumatic stress disorder, traumatic brain injury, substance abuse, mental health issues), economic concerns (unemployment, no work skills or livable income), and no safe, affordable housing. Veterans' family and social support may be broken because of having had multiple duty stations while in service or long periods away from hometowns and civilian jobs. These problems can be traced to military service experience or the return to civilian society without receiving necessary assistance and support. America's homeless veteran population is changing. Right now, most of the current homeless veteran population served during the Vietnam era. Many are aging, suffer from chronic illness and substance abuse and can't work. They need a permanent place to live and ongoing health services to help them stay in their homes. As more men and women soldiers return from Iraq and Afghanistan they will need many services - mental and physical health care, substance abuse prevention and disability rehabilitation programs, affordable housing, employment training and job placement assistance. Women veterans may be victims of sexual assault and trauma and need special health services and child care. In the next 10 years, more services and housing will be needed to serve aging Vietnam veterans, women veterans and combat veterans of America's current operations in Iraq and Afghanistan. The National Coalition for Homeless Veterans helps America's homeless veterans regain control of their lives and return to society as productive, self-sufficient citizens.